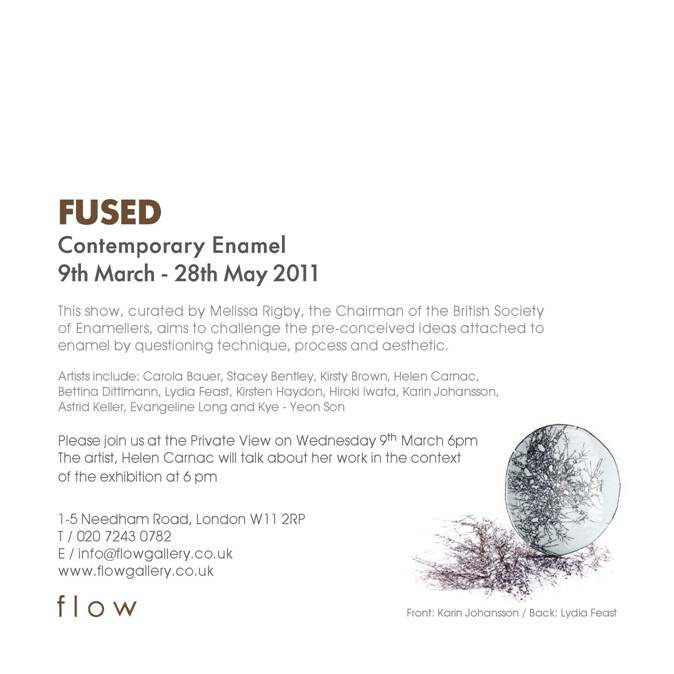 Tomorrow is the opening of the exhibition Fused at Flow Gallery. The exhibition is curated by Melissa Rigby and shows enameled pieces. Demà és la inauguració de l’exposició Fused a la galeria Flow. L’exposició està organitzada per Melissa Rigby i s’hi mostren treballs fets amb esmalts. Carola Bauer, Stacey Bentley, Kirsty Brown, Helen Carnac, Bettina Dittlmann, Lydia Feast, Kirsten Haydon, Hiroki Iwata, Karin Johansson, Astrid Keller, Evangeline Long, Kye-Yeon Son. This post is filed under Blog, Exhibitions and tagged with Astrid Keller, Bettina Dittlmann, Carola Bauer, contemporary jewelry, enamel, Evangeline Long, Flow Gallery, Helen Carnac, Hiroki Iwata, Karin Johansson, Kirsten Haydon, Kirsty Brown, Kye-Yeon Son, London, Lydia Feast, Melissa Rigby, Stacey Bentley.